Anklets are so underrated. There, I said it. Maybe I’m biased because I’ve always loved the double-anklet look. Exhibit A: DIY Rhinestone Anklet Set. Exhibit B: Sequin Ankle Straps. I’ve always felt like they’re the underdogs of jewelry pieces. It seems like necklaces and earrings always steal the spotlight. Granted, anklets can go unnoticed if they don’t make much of a statement. That’s where this project comes in. 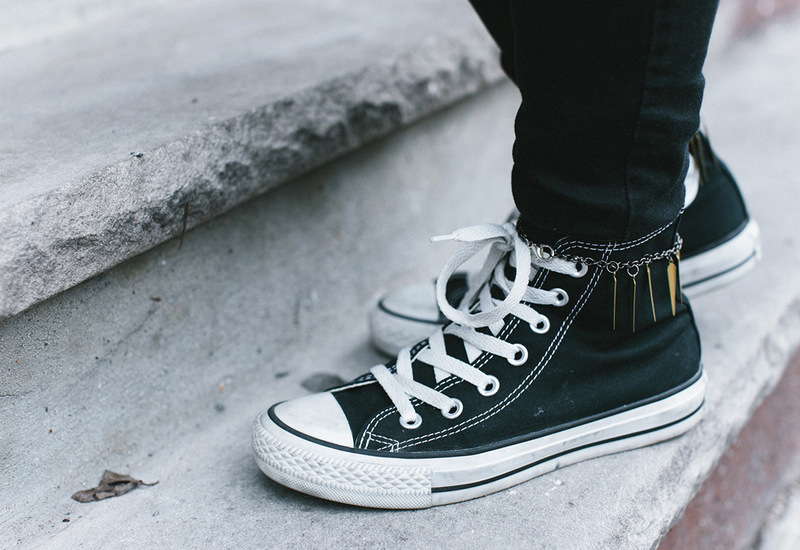 With some chain and spike charms (my personal fave), you can make a pair of Free People-esque hi-top sneaker anklets. Of course, I had to bring in my beloved black Chucks. Converse are my favorite sneakers to craft with; I’ve made Marbled Low-Tops and Watercolor Hi-Tops back when I used to work for the company. This time around, it’s all about accessorizing them. It’s basically an easy jewelry project. And like with all concepts, it all comes down to how you use it. Here’s how to make ’em. 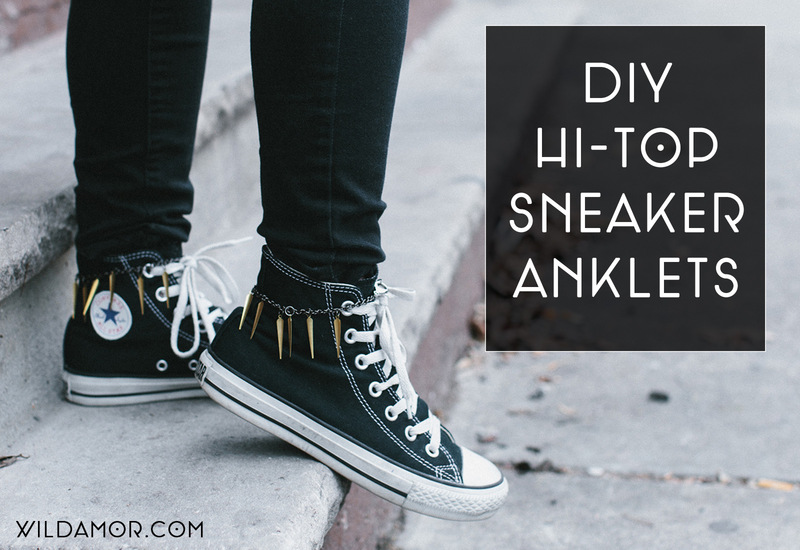 *Each strand should be long enough to fit comfortably around your ankle, while wearing hi-tops. 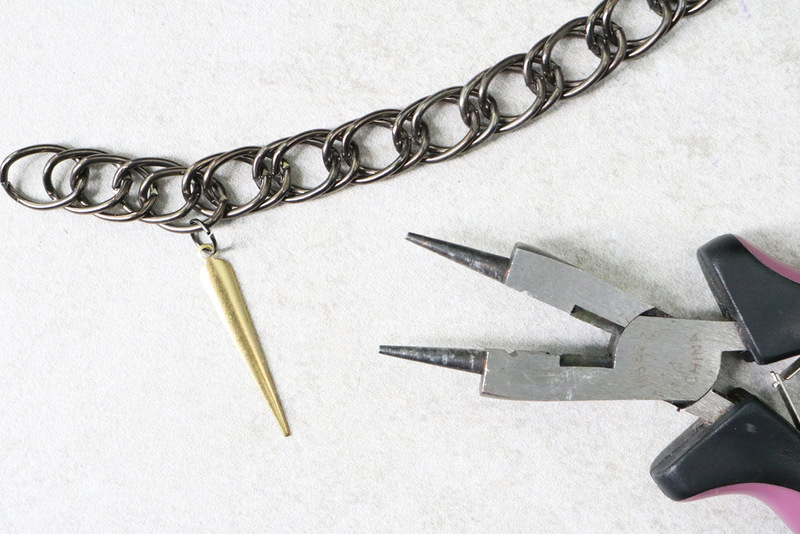 Using the pliers, attach jump ring and a charm to the chain. Repeat at equal intervals along the entire chain. 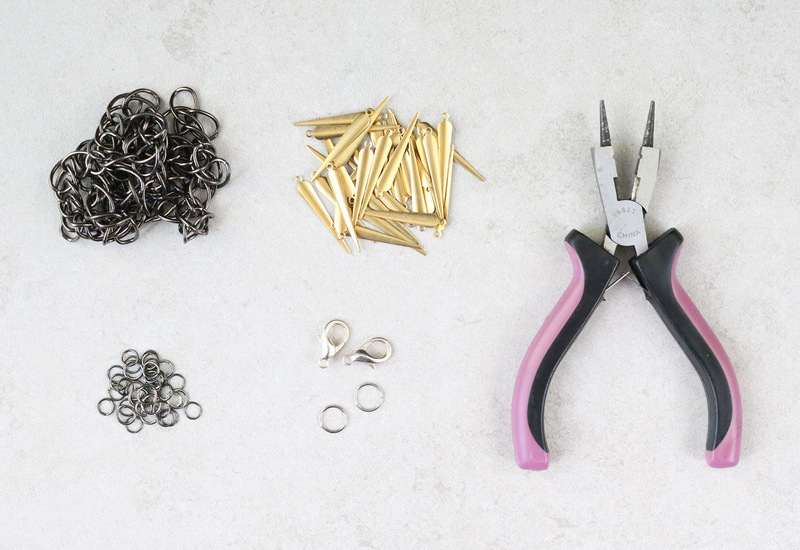 Attach a 10mm jump ring on one end, and a jewelry clasp on the other. Repeat for the second anklet. And that’s it! I love the concept of using a pretty normal jewelry piece in a funky way. You don’t have to use spike charms if that’s not your thing. I think it works well for a simple statement look, but feel free to use what you have on hand. Assorted charms and random scraps of chain can totally work. Circle and triangles charms would also look pretty rad. Hope this project sparks some inspiration!